Eric Myers was appointed as the Executive Director of the Chattanooga Design Studio in March 2017. In this role he oversees strategic development, fiscal performance, and is the Studio’s primary spokesperson to the media and the general public. Under his leadership, the Studio has begun to strengthen relationships with various outside organizations and has aligned the studio’s program focus to help the Board of Directors engage on specific mission related opportunities. A native of Maryland, Myers is a LEED accredited registered architect and urban designer with a broad ranging background and breadth of experience in Chattanooga and the Southeast. For over 22 years Eric has practiced architecture and urban design in Chattanooga. Prior to joining the Chattanooga Design Studio, Eric founded a design firm and through his 10 years of leadership, the organization helped create urban housing, commercial retail and offices, healthcare facilities, historic preservation efforts, as well as urban design and neighborhood structure plans. Eric was also urban design coordinator at the community’s legacy studio which operated from 1980 until 2005. He holds a Bachelor of Architecture degree from the University of Tennessee, Knoxville. Eric currently serves on the Chattanooga Neighborhood Enterprise Board of Directors. He is the immediate past president of Cornerstones, Inc. and past president of the Chattanooga Chapter of the American Institute of Architects. Myers also served a 2014 to 2017 appointment to the Chattanooga-Hamilton County Regional Planning Commission. Lindsey is an urban designer and architect who moved to Chattanooga in 2016 to take advantage of the quality of life this city affords. Lindsey’s experience in urban design includes work at a local landscape architecture practice, a global architecture firm in Washington, D.C. focusing on the intersection of health and placemaking and the start of her career in Pittsburgh working on neighborhood scale Ecodistrict planning. Lindsey’s diverse background and experiences give her a unique understanding of architecture, cities and the environment and the intricate relationships which influence people and place-making. Lindsey received a Bachelor of Science in Architecture from the Georgia Institute of Technology, a Master of Architecture from Clemson University and a Master of Urban Design at the University of Colorado Denver; she currently serves as a member of the Chattanooga Public Art Commission. Sally joins her background in architecture with her passion for people by designing places shaped to enhance public life and build community. She graduated with a Bachelor of Architecture from Syracuse University in 2013 and returned to her home town of Chattanooga, where she practiced architecture until joining the Studio in 2017. As Urban Designer at Chattanooga Design Studio, she actively collaborates with governmental, non-profit, and private entities to strengthen public space. Sally is a founding member and co-director of CURB, which uses tactical urbanism to address larger issues in Chattanooga. She also manages the CDS programs Robert Taylor Speaker Series and Film Friday, both aimed to increase the reach and accessibility of themes affecting urban life. Sally has served on the boards of Ivy Academy and the UNFoundation, is the secretary of the Battery Heights Neighborhood Association, and is an active volunteer with Redev Workshop and AIA Extended Studio. The Chattanooga Design Studio seeks an enthusiastic, charismatic and detail-oriented professional to support its mission and help guide the Studio’s design efforts. The Design Studio is a non-profit community resource that promotes excellence in urban design in Chattanooga through education, facilitation, and collaboration. As a steward of the city’s rich legacy of urban design and planning, the Studio will strive to increase public awareness of urban design issues and their impact upon our quality of life. With a particular emphasis on the importance of the public realm, the Studio will provide high level coordination of urban design efforts to help frame a vision for the future growth of the city that promotes optimal value for the community. Click here for more about the position. Christian Sinclair Rushing was a founder and the first executive director of The Chattanooga Design Studio. He died Wednesday, February 1, 2017, after a two-year struggle with gall bladder cancer. In many ways, The Chattanooga Design Studio will be a perpetual memorial to Christian’s leadership, his vision, and his unwavering courage. He will live forever within the influence of the lives that he touched and his efforts in urban design. Christian will always be remembered as a great leader who led with great charm. Christian believed that good design is for everyone. He also believed in the power of collective will and collaborative visioning. He held a bachelor’s degree from the University of New Mexico, and a master’s degree from Auburn University. Christian led and contributed heavily in several urban design visioning processes in Chattanooga and other cities in the US for two decades. 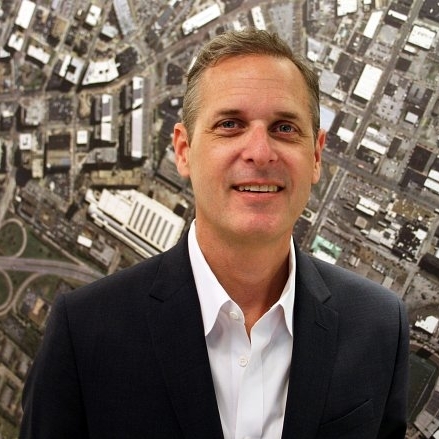 He moderated River City Company’s Urban Design Challenge, created the Urban Design Studio Retrospective, and served as lead consultant for Chattanooga’s City Center Plan. Christian was Senior Planner in Chattanooga’s former Downtown Planning & Design Studio for five years and in 2005 he was a founding principal of the planning firm, Kennedy, Coulter, Rushing & Watson. He also designed and developed the LEED award-winning Madison Street homes in 2008. Christian’s weekly writings instilled many faithful readers with hope and joy while providing an infusion of his opinions and a glimpse into his extraordinary character. But he was more than a talented writer, with a personality larger than the South, his river of life and love were filled by design, sports, cooking and above all his family. He was an enthusiastic chef often testing the genius of the likes of Escoffier and Henderson. The Chattanooga Design Studio is forever indebted to Christian Rushing’s efforts and talents. It is with Christian’s memory that we recall the connection of life which binds us all and further reminds us to cherish the virtues of urban design that are rooted in human liberty and human happiness. Christian’s self-written obituary may be read here.